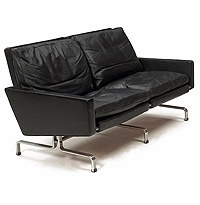 Poul Kjaerholm (1929 Oster Vra - 1980) Danish designer. Born in 1929 in Oster Vra, Denmark, Kjaerholm began as a cabinetmaker's apprentice with Gronbech in 1948, going on to the School of Commercial Art in Copenhagen in 1952. He was very articulate and with his natural authority he started an outstanding career as an educator in the same year (1952) but continued to study with Prof. Palle Suenson. 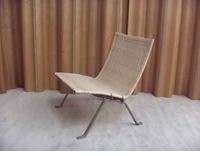 From the mid 1950s he worked for his friend Ejvind Kold Christiansen, an entrepreneur who, giving him tremendous artistic freedom, produced an extensive range of his furniture. 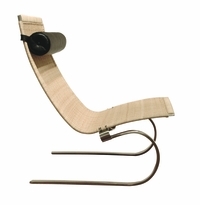 His distinctive style is evident as early as 1952 in his PKO minimalist plywood series. 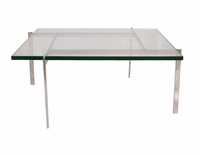 The PK61 coffee table of '55 is a playfully irrational supporting frame visible through the glass top. 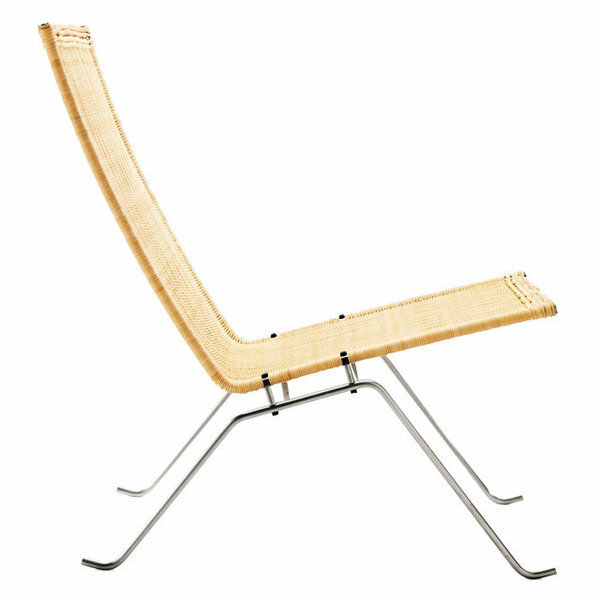 In 1958 he attracted international acclaim for his contributions to the 'Formes Scandinaves' exhibition in Paris and the award of the legendary 'Lunning Award', the same year for his PK22 chair. In both 1957 and 1960 he won the Grand Prize at the Milan Trennali. In 1959 he became assistant at the Royal Danish Academy of Arts in Copenhagen and lecturer. 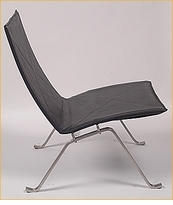 In 1965 his PK24 Chaise Longue typified his mature style. 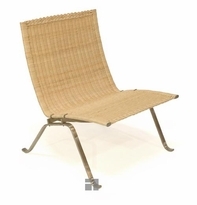 Its simple flowing lines combine steel and woven cane. 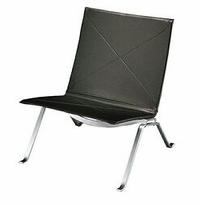 In 1967 he was awarded the Danish ID Prize for product design. He became head of the Institut for Design in 1973 and finally professor in 1976 until his death 4 years later. 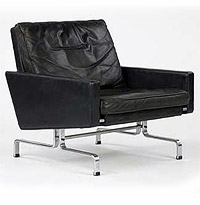 Most of his furniture was initially produced by his friend E. Kold Christensen in Hellerup. 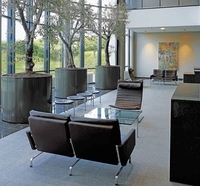 Since 1982 a wide selection of those products have been produced by Fritz Hansen, a leading Danish furniture manufacturing firm. 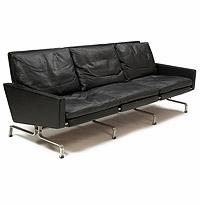 The Poul Kjaerholm collection still appears modern and futuristic today. In 2002 it was featured in the Science Fiction Film "Minotrity Report". His designs are in the permanent collection of the Museum of Modern Art in New York, the V&A Museum in London and other museum collections in Denmark, Norway, Sweden and Germany. He won numerous awards in industrial and graphic design, including two Grand Prix at the Milan Trienale (1957 & 1960), the ID Award and the legendary Lunning Award. Our Poul Kjaerholm series of design classics are custom crafted using the finest materials. This series features imported European frames. Gibraltar assembles them overseas to save on the labor costs. We manufacture these reproduction editions at our own factory to avoid the high mark ups that the other European makers charge. All in all, you get an exact copy of the original at a fraction of the price! Gibraltar Furniture has been in business for 50 years. Yahoo News reports that Gibraltar Furniture has "The best prices, models, and service of any site on the Internet." Yahoo News, click here.